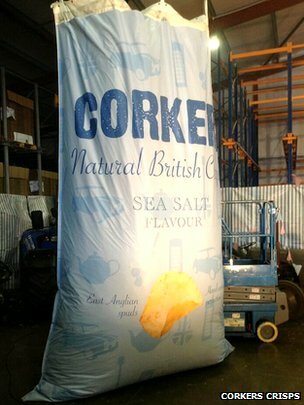 UK brand Corkers Crisps, owned by Rod Garnham and Ross Taylor, is certainly a ground-breaking Potato Crisps company. The Cambridgeshire based firm broke the World Record for the largest ever bag of Chips or Crisps in September 2013. The bag pictured was a staggering 5.5 metres in height and was sufficiently strong to hold over a tonne of Potato Crisps. However, this incredible feat was not the first stunt Corkers Crisps have pulled on the Potato Chips & Crisps marketing world. On 11th October 2012, Corkers Crisps flew higher than any Crisps have flown before: Space. Corkers are the kind of company that shows just what the little guys can do. They clearly have a passion for their product and enjoy their world. It is the kind of enjoyment huge multi-nationals, restricted by budgets, balances, targets and profit margins, probably can't get from the Wonderful World of Chips & Crisps.